The Indian Express explains how UPI-based digital payments application, BHIM will work, and the problems it faces. Last week, Prime Minister Narendra Modi announced a new digital payments app named BHIM — Bharat Interface for Money — after Babasaheb Dr Bhimrao Ambedkar. It is for now available only on Android — so iOS and Windows mobile users are left out. The BHIM app is supposed to support Aadhaar-based payments, where transactions will be possible with just a fingerprint impression, but that facility is yet to start. So what can BHIM do? BHIM is a digital payments solution app based on the Unified Payments Interface (UPI) from the National Payments Corporation of India (NPCI), the umbrella organisation for all retail payments systems in India. If you have signed up for UPI-based payments on your bank account, which is also linked to your mobile phone number, you’ll be able to use the BHIM app to carry out digital transactions. BHIM will let you send and receive money to other UPI accounts or addresses. You can also send money via IFSC (Indian Financial System Code) and MMID (Mobile Money Identifier) Code to users who don’t have a UPI-based bank account. There’s also the option of creating your own QR (Quick Response) code for a fixed amount of money, which the merchant can scan to make the deduction. Is BHIM then just another mobile wallet? No. You can store a limited amount of money in a mobile wallet like Paytm or MobiKwik, which you can send only to someone who is using the same wallet. But BHIM is UPI-based, and thus linked directly to a bank account. All the payee needs is a bank account. If this account is UPI activated, you can just ask for the payee’s VPA or virtual payment address, and make the payment to that account. WATCH VIDEO | Bhim App: How To Use? Otherwise, there’s the option of IFSC or MMID for sending or receiving money. The advantage is there’s no need to remember an account number, or to share it with anyone. The VPA is all that is needed. Up to Rs 10,000 can be sent per transaction, and up to Rs 20,000 in any 24 hours. The list is long: Allahabad Bank, Andhra Bank, Axis Bank, Bank of Baroda, Bank of Maharashtra, Canara Bank, Catholic Syrian Bank, Central Bank of India, DCB Bank, Dena Bank, Federal Bank, HDFC Bank, ICICI Bank, IDBI Bank, IDFC Bank, Indian Bank, Indian Overseas Bank, IndusInd Bank, Karnataka Bank, Karur Vysya Bank, Kotak Mahindra Bank, Oriental Bank of Commerce, Punjab National Bank, RBL Bank, South Indian Bank, Standard Chartered Bank, State Bank of India, Syndicate Bank, Union Bank of India, United Bank of India, and Vijaya Bank. OK, and how exactly does the app work? BHIM lets you choose your preferred bank, after it has verified your mobile number. You get an SMS, so it’s best to use the same number as the one that’s linked to the bank account. BHIM will ask you to set a 4-digit passcode. Pick something you won’t forget easily because you’ll need the code every time you open the app. The app will then ask you to select your bank. If your account is UPI activated, it will reflect the relevant number. You’ll see options to send and receive money, and transact via IFSC. If UPI is not activated, you can put in six digits of your debit card number, and the expiry date, after which the app will let you use it. To send money, type in the mobile number or VPA address. BHIM will verify the payee. Type in the amount, and hit pay. If the payee doesn’t have UPI, tap on the three dots above the send money option. The ACCOUNT + IFSC option will open up, where you can put in the details. And how do I know if my bank supports UPI? 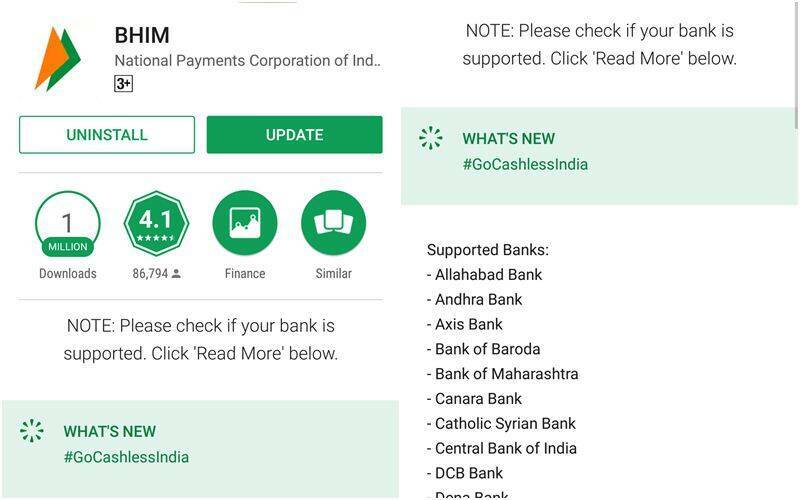 According to NPCI’s web site, when UPI went live in August 2016, banks with supporting apps on the Google Play store were: Andhra Bank, Axis Bank, Bank of Maharashtra, Bhartiya Mahila Bank, Canara Bank, Catholic Syrian Bank, DCB Bank, Federal Bank, ICICI Bank, TJSB Sahakari Bank, Oriental Bank of Commerce, Karnataka Bank, UCO Bank, Union Bank of India, United Bank of India, Punjab National Bank, South Indian Bank, Vijaya Bank and YES Bank. Since then, HDFC Bank’s Android app too has started supporting UPI, and the list of banks has expanded to 30. In November, State Bank of India’s UPI-support app called SBI Pay went live. How do I create a VPA for UPI on my account? Make sure your mobile number is linked to your bank account, and then get the the bank’s official mobile banking app from the Google Play store. Do check the developer, etc. before installing because you need to make sure you are not downloading a malicious or fake app masquerading as one from your bank. If unsure, check with the bank. Once you have the app, you’ll be able to locate the tab about UPI payments. Go there and create a VPA. Keep it simple, so that you don’t forget it — such as your name@your bank’s name. Then create a UPI PIN, which will be needed to complete a transaction in BHIM. Once your VPA is created, you’ll see options to send, receive money or pay by scanning QR code. If you have more than one account with the same bank, you can choose the default account for transactions via UPI. This VPA is essentially all that you need to carry out a transaction. What’s so special about BHIM then? As of now, iOS users are out of this system — and Apple devices are used by affluent users who are often likely to do a lot of digital transactions. From an infrastructure point of view, there’s a long way to go before BHIM becomes India’s default payments app. The Internet is spotty or non-existent across vast swathes of the land. And the Aadhaar-based payments part for BHIM is yet to be rolled out fully. 2 After Donald Trump blows to climate change fight, could it still be business as usual?